Once a fighting technique is thoroughly learned through sincere, diligent training, it is "forgotten" or disregarded on the conscious level. Later, when we spar, all our hard work pays off; there are no "accidents" and we fight spontaneously, automatically. As I see it, most students don't experiment enough with their sparring, relying on just a few moves. In contrast, kata, the ultimate expression of an art, forces us to utilize a depth and variety of moves that we would probably never come close to using in regular sparring. Kata, unlike kumite, allows us to train with no inhibitions, at full power and speed at any age. In time, the trainee will come to realize the only way to infuse true passion into his or her chosen art will be through stilling the mind. Kata practice is one way of accomplishing this, but is there something else we can do to hasten the process further still? According to martial arts historian, Donn Draeger, samurai who lived during Japan's Feudal period practiced the art of mokuso - meditation to give them confidence in battle. Meditation is largely misunderstood in our culture, but it is simply the practice of the discipline of removing unwanted mind-chatter. Sitting still with eyes closed, focusing on normal breathing and becoming aware of our thoughts is a radical undertaking that can have tremendous ramifications on our psyche. Meditation has roots not only in the East, but also in Native American, Australian-Aboriginal and African cultures, and certain Orthodox Christian and Kabbalic (Jewish) faiths. 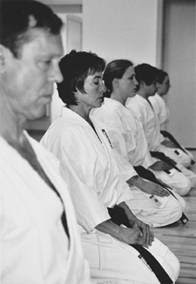 Meditation, the art of invoking present moment awareness, is a tool that is capable of sharpening focus, and bringing about detached resolution - attributes for the martial artist, but also something that can be life-transforming.